Most sinningias appear to be very tolerant of soil type, growing well even in commercial potting mixes intended for tomatoes and marigolds. This is in contrast to chiritas and petrocosmeas (for instance). A cautionary example is shown of what happens when the soil isn't good, and what was done about it. I pot all my sinningias in Supersoil, a commercial product developed by an orchid wholesaler in the San Francisco Bay Area. Supersoil contains neither perlite nor vermiculite, nor do I add any. For epiphytic cacti and for orchids, I add up to 50% bark, but not for sinningias. In general, I have been quite pleased with the results. Getting soil directly out of a bag, without any mixing, makes repotting much easier. I even sow sinningia and cactus seed directly in Supersoil, with good results. However, there have been a few exceptions. This picture shows two seedling trays and four pots. The tray on the right was sown on 24 August 2008. The tray on the left was sown on 5 November 2008, 75 days later. This picture was taken on 16 December 2008, 41 days after the second sowing. All the seeds were sinningias. 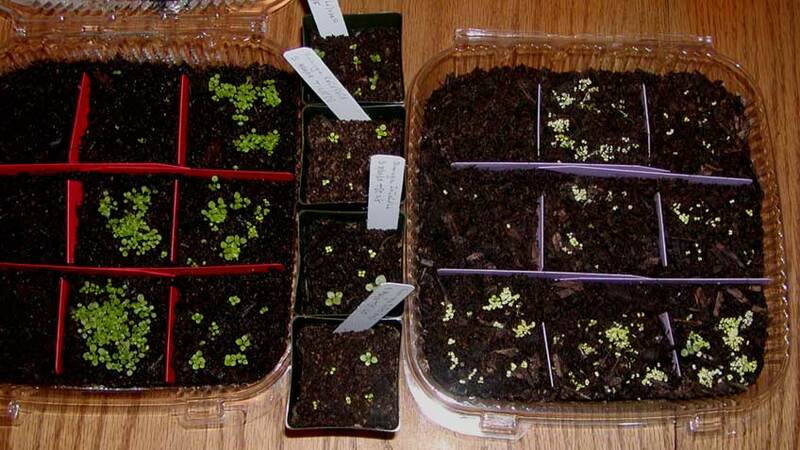 The seedlings in the right-hand tray are pale, weak, and small. The seedlings in the left-hand tray are dark and healthy, and at least as large as the ones sown 75 days earlier. The four pots in the middle contain seedlings transplanted out of the right-hand tray on 5 December 2008, 11 days before the picture. Although paler than the ones in the left-hand tray, they are already darker and larger than the ones in the right-hand tray they came from. As I write this on 4 February 2009, the seedlings in the four pots are flourishing. Many of the seedlings in the right-hand tray were transplanted to another tray and are now growing well too. The seedlings in the left-hand tray have continued to flourish and some have been transplanted. What I deduce from all this is that the right-hand tray contains bad dirt. The late Fred Stryker, another member of the Peninsula Gesneriad Society, told me more than once that he believed the composition of Supersoil changes through the year. An employee of the nursery where I buy it denies this, but I'm with Fred on this. I will continue to buy Supersoil, because it is cheap, convenient, and usually effective. However, I will be much more alert for weak growth, especially in seedlings, and will be ready to transplant when they languish.